Paul Benjaman, Wink Burcham, and Beau Roberson, musicians at the forefront of the New Tulsa Sound movement, lead a jam, full band in tow, that includes many of Tulsa’s notable musicians sharing, song swapping, jamming, and generally mixing it up on stage. 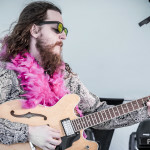 Benjaman’s groove-based mix of rock, jazz, funk, be-bop, and swing—punctuated throughout by tasty guitar licks—melds beautifully with Burcham’s old-soul vocals, heartfelt story-based lyrics, and bluesy playing. Benjaman and Burcham (a semi-finalist at the 2013 International Blues Competition in Memphis) have opened for or toured with Sonny Landreth, Heartless Bastards, Ian Moore, Lucinda Williams, Martin Sexton, Ramblin’ Jack Elliott, The Gourds, Jimbo Mathus, Dale Watson and many others. Roberson heads up the noted Tulsa band Pilgrim. Check out Horton Records’New Tulsa Folks compilation, featuring Benjaman, Burcham, Roberson and many of the artists who will be participating in the Tulsa Roots jam.